To be a strong writer, it’s important, even vital, to read a variety of authors, which is what we do at the Studio each week. Contemporary, classics, American, European and beyond. 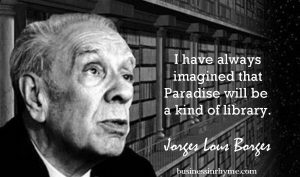 We’ve been talking now about the Argentine short-story writer, essayist, poet and translator, Jorge Luis Borges, who was born in 1899 and died in 1986. Borges was one of the most influential writers of Spanish literature and his style of writing was thought to mark the beginning of the magical realism movement in 2oth century Latin America. The story we studied was a kind of tale titled The Gospel According to Mark. You can read the story before listening, or print and follow along with the class. Another option is to click here and listen to Paul Theroux read it as part of The New Yorker Fiction podcast. Together, we work the material in order to discover the plot and what the writer did in his sentences to develop his protagonist. It’s a great conversation and will help you, as a writer, think more deeply about your own storylines! Enjoy.